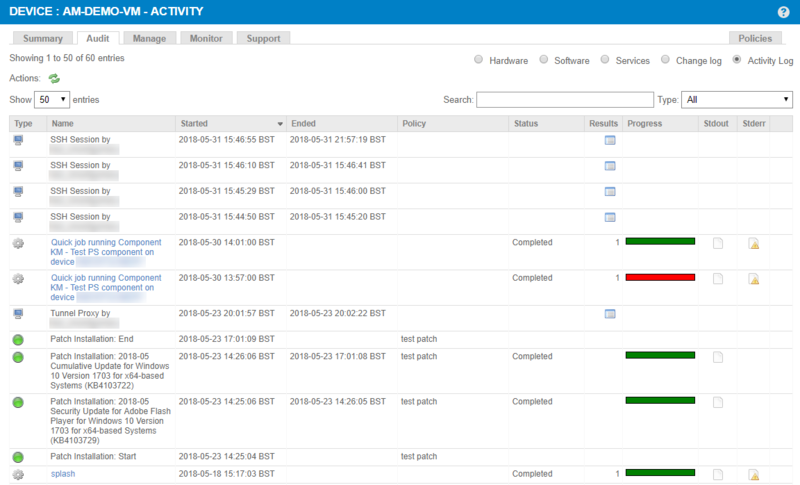 The Activity Log page shows a list of activities associated with a specific device, no matter who performed the activity. Datto RMM retains six months of device activity logs. The listed items include patch and software installations, jobs, remote actions, data about when the device was moved from one site to another, and much more. The most recent activities are also displayed on the Device Summary page. Actions Refresh - Refreshes the current view. Show entries Select to show 10 / 25 / 50 / 100 entries per page. 50 is selected by default. • All - Selected by default. It displays all types of activities. • Patch - Once selected, you can filter by Status: All (selected by default), Completed, Failed. • Job - Once selected, you can filter by Status: All (selected by default), Completed, Cancelled, Expired, Running, Scheduled. • Security - Once selected, you can filter by Status: All (selected by default), Completed, Warnings, Failed. • Software Management - Once selected, you can filter by Status: All (selected by default), Failure, Success. Previous / Next Click a page number or click Previous / Next to jump to the previous / next page of results. Type The type of activity represented by its icon. Hover over the icon to see the name of the activity type. Name The name of the activity. Job names are hyperlinked. Click the hyperlink to see the job. Refer to The job view. Click the column header to sort by this column. Started Start date, time, and time zone of the activity. Click the column header to sort by this column. By default, the data is sorted by this column. The latest activity is listed first. Ended End date, time, and time zone of the activity. Click the column header to sort by this column. Policy The name of the policy that targeted the device. Click the column header to sort by this column. Status The status of the activity. Click the column header to sort by this column. Results If a summary icon is displayed, you can click on it for more information about the activity results. Click the column header to sort by this column. Progress A color indicator of the progress of the activity. For more information on job results, click the name of the job. Refer to The job view. Stderr Click the icon to view the Stdout (standard output) and Stderr (standard error) message for the device. Although Stdout and Stderr are normally used for jobs, patch and software installation information is also stored here. For job outputs, refer to The job view.